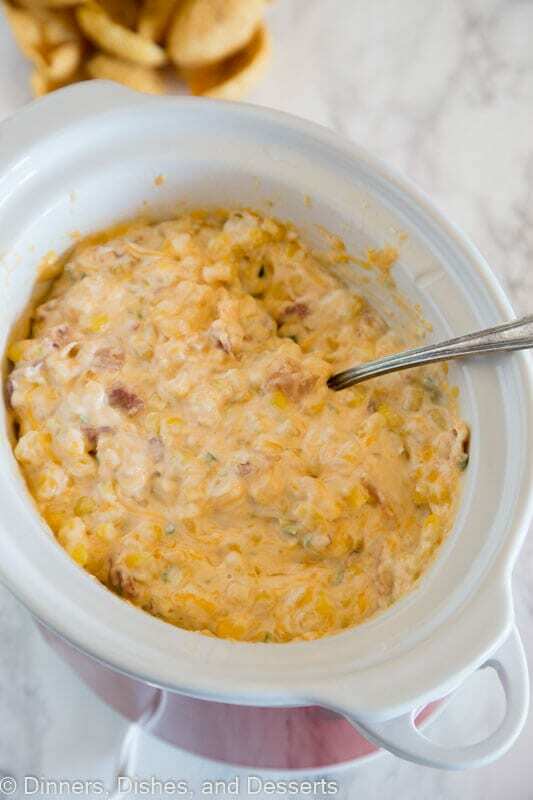 Cheesy Corn Dip – a delicious hot dip with jalapeno, corn, bacon, and plenty of cheese! 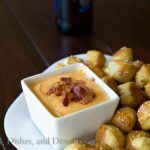 Comes together in minutes, and perfect for snacking or entertaining! Do you have a dish that you are known for? Like if you are invited to a party or have friends over, everyone expects it. Maybe it is your Perfect Chocolate Chips Cookies that you bring everywhere. For me it is a couple of things. My husband says I have a one track mind when it comes to dessert, and Skillet Cookie is the only thing I want to make or eat when we entertain. 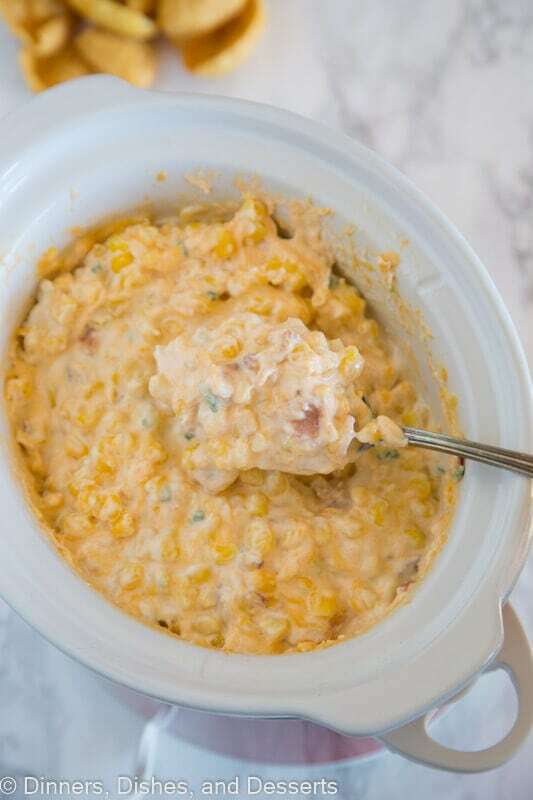 The other thing is this corn dip. I made it pretty much every time I have to take an appetizer to a get together. And it disappears every time. 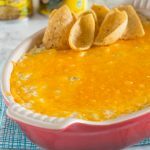 This cheesy hot corn dip is a hit with kids and adults alike. Every time I show up with my little red crock pot my friends ask if I made the corn dip recipe. So yeah, I have become known for it. I can’t believe it finally took me this long to take pictures and actually blog about this recipe! 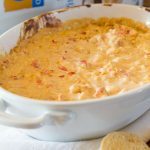 I have messed with this corn dip recipe quite a bit over the years. I have added more bacon, more cheese, less cheese, no jalapeno, spices etc. This is our favorite version. 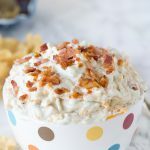 More bacon and it takes over the dip. No jalapeno, and it lacking that something. 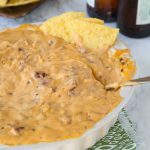 This is the right amount of a hint of spice, just a little bit of smokiness, and lots of creamy cheese! 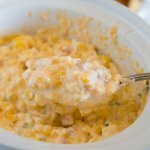 I like to mix this cheesy corn dip together in a bowl, and then put in the crock pot on low of a few hours to get it all hot, melty and gooey. But if you are in a hurry, baking it for 30 minutes would be great too. Just make sure to add it to the menu for your next get together, and your friends will thank you! It is one of those recipes you can make ahead of time, and then just heat when it is time to serve as well. 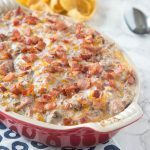 Hot Sausage Dip is another like that. You can assemble the day before, then just heat the day you want it. 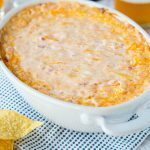 So when you are planning for game day, your next party, or even just hanging out and you want to change up your appetizers try this corn dip. It is a staple in our house and that will not be changing anytime soon. 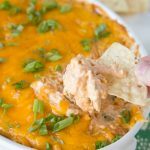 Although I am really wanting to try Bread Bowl Pizza Dip at our next game day party. 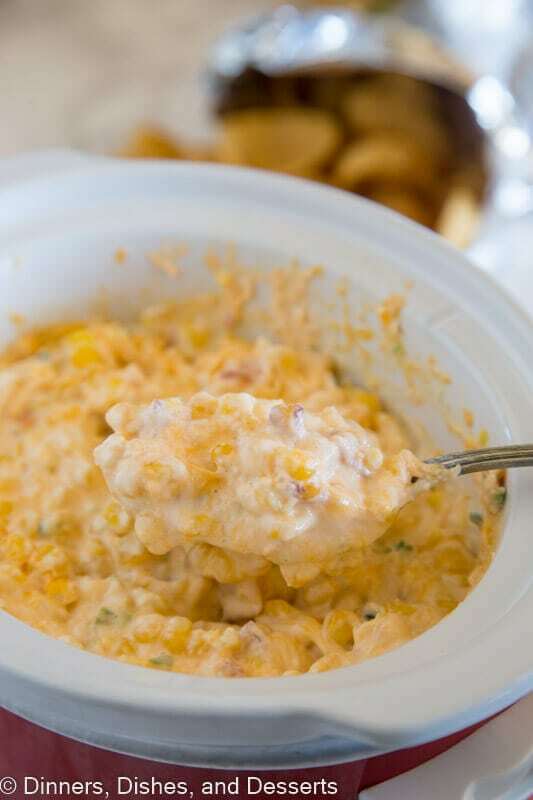 Cheesy Corn Dip - a delicious hot dip with jalapeno, corn, bacon, and plenty of cheese! Comes together in minutes, and perfect for snacking or entertaining. In a large bowl combine all of the ingredients until well blended. Pour into a crock pot or baking dish. Cook on low for 4 hours in crock pot for bake at 350 for 30 minutes, or until bubbly in the oven. Serve with corn chips for dipping. looks great. I always saved recipes that I like on yumprint starting in 2013. But I think somethingswrong with the website. what a shame. now where do I save recipes. Yumprint was such a great, great website easy to maneuver mand FREE you could add as many recipes as you like, no limit. the site was just plain YUM. do you know a similar site I could strt using?? This is a game day must have! Love that you added jalapeno for a bit of heat. This looks absolutely amazing I cannot wait to try it ! YUM! 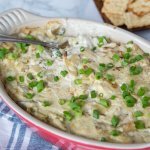 So easy and perfect for game day! Oh how delicious this recipe looks! Can’t wait to try this, so easy and yummy! It look so yummy! I want to try it immediately. Wonderful combination of ingredients. Looks like a new favorite for my kids!! 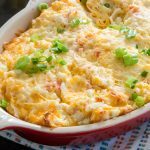 Corn dip is one of my favorites! This recipe looks to die for!! YUM!! 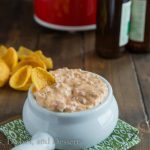 We love this tasty dip! Love this stuff!! Thank you so much!! 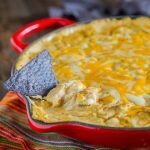 I like cheese and I like corn, so this dip sounds like a winner! !